Tree topping can help protect your home from property damage and help preserve the health of your trees. 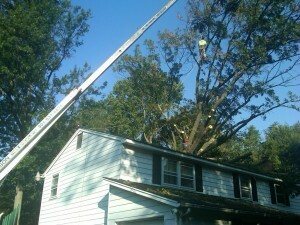 One of the many services we offer at Nelson Tree Specialist is tree topping. Professionally done tree topping can yield many benefits for homeowners. You want your trees to look good, but also reduce the potential for problems later on down the road. And tree topping could also save your tree from potential destruction. Let’s take a look at why tree topping might be needed for your tree. Thunderstorms have the ability to wreak havoc on your property. Winds from storms are sometimes strong enough to bend your tree’s branches and limbs. This is due to the leverage caused by the height and length of the tree and its limbs. Professionally done tree topping is able to minimize the potential for damage caused by strong storms. Your tree may be grown to such an extent that it is interfering with another part of your property. Most often this happens to be other trees or power lines. A skilled arborist is able to use tree topping to free up this interference without compromising on the aesthetic beauty or health of your tree. Trees sometimes have too much weight on one side or another and may have a slight lean. This is potentially problematic, as the weight can eventually lead your tree to collapse. It may end up causing property damage, or, even worse yet, severe damage to your home. Tree topping can be utilized to correct the center of gravity of the tree. This stops the leaning of the tree and allows you to not worry about the potential for surprising property damage. Call Nelson Tree Specialist for your tree topping services. We are experts in the art of tree topping and want to work with you to provide the best care for your trees. After we’re done, your trees will be thriving and safe as they beautify your landscape. Contact us today for your free quote. We will respond in a timely manner. If you need us, we’re available for emergency services 24/7. No task is too much to ask. This entry was posted on Tuesday, September 20th, 2016 at 4:24 pm. Both comments and pings are currently closed.